Yesterday was a holiday in Quebec, but today we're heading from North America across the Atlantic and into Eastern Europe. We have another holiday for you in the form of Slovenia's Statehood Day, the day that the country became independent from Yugoslavia. If you haven't been, modern Slovenia is a beautiful place that definitely deserves its own post. It goes without saying that the native and official language of Slovenia is Slovene, which is spoken by nearly 90% of the population. With Italy and Hungary just next door, Slovenia also has a decent number of speakers of Italian and Hungarian. 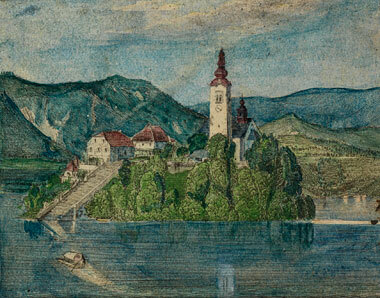 An artist's rendition of the island on Lake Bled, Slovenia. Serbo-Croatian languages such as Serbian, Croatian, Bosnian, and Montenegrin can also be found in Slovenia. The Romani language, despite being spoken by only 0.2% of Slovenia's population, is protected under Slovenian legislature. Historically, Slovenia's linguistic landscape was significantly different. Unfortunately, World War II and the events that followed were hugely detrimental to the ethnic, racial, and linguistic diversity of then Yugoslavia. German used to be spoken in Slovenia, but an expulsion of German people following the Second World War led to a hefty decline in speakers, leaving German to be natively spoken by fewer than 2,000 people in the whole of Slovenia. The Bavarian dialect of German, Gottscheerish, was also historically prominent in Slovenia. Again, this language also suffered due to expulsion of its speakers following WWII. The Czech language also suffered a similar fate to German and Gottscheerish and is now seldom spoken in Slovenia. That's it for this week's special days and holidays. Tomorrow we'll be back to our regular schedule with our weekly language profile.